The 2014 Dodge Avenger is an adequate midsize family sedan, but you'll find that most competitors offer roomier interiors, fresher designs and better fuel economy. For 2014, the Dodge Avenger sees no notable changes. Strong V6 engine; composed ride and handling. 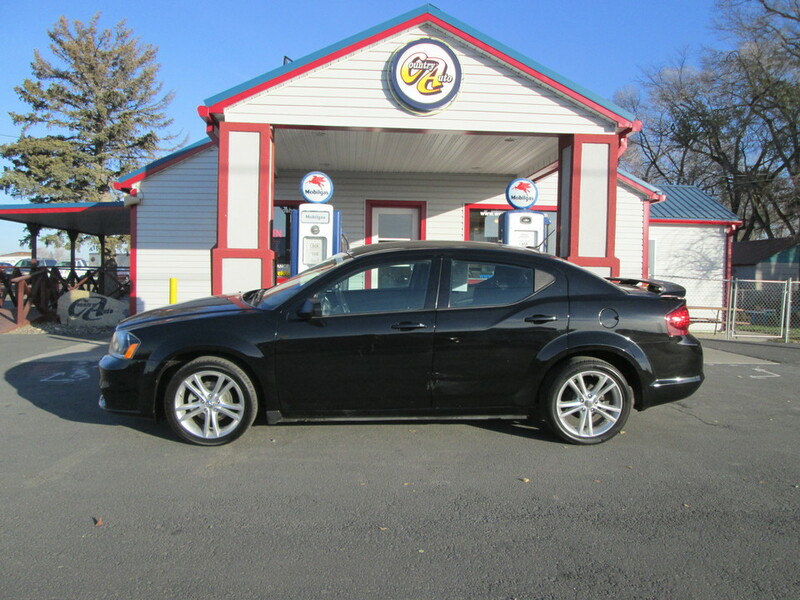 Taken on its own, the 2014 Dodge Avenger is pleasant enough. This front-wheel-drive midsize sedan looks pretty cool thanks to aggressive styling that mimics Dodge's larger, rear-drive Charger sedan. There's also a powerful available V6 and a starting sticker price that undercuts most of the superstars in the midsize car class. Beyond this, though, the Avenger pretty much runs out of gas. The Avenger's four-cylinder engine makes decent power, but its efforts are hampered by an old-school four-speed automatic transmission that blunts both acceleration and fuel economy. Even with the SXT's six-speed auto, fuel economy is lackluster. The cabin is also a mixed bag. Although generally agreeable in terms of ergonomics and comfort, it lacks a few of today's expected electronic conveniences (such as a rearview camera) and the backseat is noticeably less roomy than the accommodations in many rivals. Although the 2014 Dodge Avenger appears to be a pretty good deal on paper, most consumers are likely to find that competing midsize sedans are a better fit. If it's a spirited driving character and sharp styling you're after, check out the Ford Fusion or Mazda 6. If you're looking for maximum comfort and interior room, the Honda Accord, Toyota Camry and Volkswagen Passat should be on your test-drive list. All of these cars offer better fuel economy to boot. In short, the 2014 Dodge Avenger will meet your basic needs, but we can't recommend it in a segment that has so many other excellent choices. The 2014 Dodge Avenger is a midsize sedan available in three trim levels: SE, SXT and R/T. The base SE comes standard with 17-inch steel wheels, air-conditioning, full power accessories, cruise control, a height-adjustable driver seat, a tilt-and-telescoping steering wheel, a fold-flat front passenger seat and 60/40 split-folding rear seat, and a four-speaker sound system with a CD player and an auxiliary audio input jack. Options include satellite radio, a couple of appearance packages (Blacktop and Rallye that include 18-inch alloy wheels) and a V6 package that bundles the larger engine and six-speed automatic transmission with alloy wheels, a rear spoiler and dual exhausts. Bluetooth phone and audio connectivity with a USB port is a stand-alone option. The SXT adds a number of desirable features to the SE's standard equipment including 17-inch alloy wheels, an upgraded transmission, automatic headlights, foglights, heated mirrors, automatic climate control, an eight-way power driver seat, a leather-wrapped steering wheel, a trip computer and a six-speaker sound system with satellite radio. Options packages here include Blacktop or Rallye, and a Sun and Sound package that includes a sunroof, an auto-dimming rearview mirror, a navigation system, a 6.5-inch touchscreen display, Bluetooth and a USB port. Other stand-alone options include the V6 engine, chrome-clad alloy wheels, leather upholstery and heated front seats. The R/T adds the V6 engine as standard, plus distinctive exterior trim, 18-inch alloy wheels, upgraded steering, a sport-tuned suspension, remote start, heated front sport seats with unique cloth and leather upholstery, an auto-dimming rearview mirror, Bluetooth and the upgraded audio system (plus Boston Acoustics-branded speakers). The only options are the Sun and Sound package or, individually, navigation or the sunroof. The 2014 Dodge Avenger SE and SXT come with a standard 2.4-liter four-cylinder that produces 173 horsepower and 166 pound-feet of torque. Power is sent to the front wheels through a four-speed automatic transmission in the SE and a six-speed automatic in the SXT. The six-speed is optional for the SE. Either way, though, fuel economy is below average for a midsize sedan, with EPA-estimated 24 mpg combined (21 city/30 highway) with the four-speed and 24 mpg combined (20 city/31 highway) with the six-speed. In Edmunds performance testing, a V6-powered Avenger R/T went from zero to 60 mph in 6.7 seconds, an average time for a V6 midsize sedan. EPA-estimated fuel economy is 22 mpg combined (19 city/29 highway). The 2014 Dodge Avenger comes standard with stability and traction control, antilock brakes, active front head restraints, front-seat side airbags and side curtain airbags. In Edmunds brake testing, an Avenger with 18-inch wheels came to a stop from 60 mph in 123 feet, an average distance for this class of car. In government crash tests, the Avenger earned an overall rating of four stars (out of five), with four stars for total frontal-impact safety and four stars for total side-impact safety. The Insurance Institute for Highway Safety gave the Avenger its top rating of "Good" in the moderate-overlap, side-impact and roof-strength tests. Its head restraints and seats also earned a "Good" rating for whiplash protection in rear impacts. The Avenger earned a second-best "Acceptable" rating for the small-overlap frontal impact test. The Avenger's interior design is rather unremarkable, but overall materials quality is respectable. Most controls are straightforward and easy to use, although the optional touchscreen's design and menu structure is outdated and unintuitive. Furthermore, commonplace technology like a rearview camera and rear parking sensors aren't even offered as options here, a definite negative in a car with thick rear roof pillars that hamper visibility. Up front, the seats are comfortable, though the seating position feels unusually elevated, a trick designers used to gain a little more legroom. The backseat is a tad cramped, a byproduct of the Avenger's more compact overall dimensions. The trunk is likewise on the small side with just 13.4 cubic feet of capacity, though the Avenger does have a fold-flat front passenger seat and 60/40 split-folding rear seatbacks. On the road the 2014 Dodge Avenger delivers strong performance when equipped with the 3.6-liter V6, an engine that also delivers livable fuel economy. The 2.4-liter four-cylinder is underwhelming, but is probably good enough to meet the needs of most buyers as long as you get the six-speed automatic transmission. Overall, the SE and SXT models are enjoyable to drive, with the suspension delivering a comfortable ride and decent handling. Folks looking for a sportier driving experience can opt for the R/T, which benefits from a firmer suspension, albeit with some loss of ride comfort. The crisp, nicely weighted steering is a plus, even though it's still not quite as sharp as the steering in a competitor like the Mazda 6.